The Atlanta chapter of the International Association of Business Communicators (IABC) today announced that several of its member companies earned top honors in the 2018 IABC Gold Quill Awards program, which recognizes excellence globally in business communications. Entrants from 13 different countries participated in this year’s Gold Quill Awards competition. Atlanta-area winners include the American Cancer Society, Realm Inc., SunTrust Bank and UPS. Considered the “Pulitzer Prize” of the communications field, the Gold Quill Award recognizes excellence in communication and honors the dedication, innovation and passion of communicators on a global scale. The awards were presented in June at the annual Excellence Gala, held in conjunction with the IABC World Conference in Montreal. 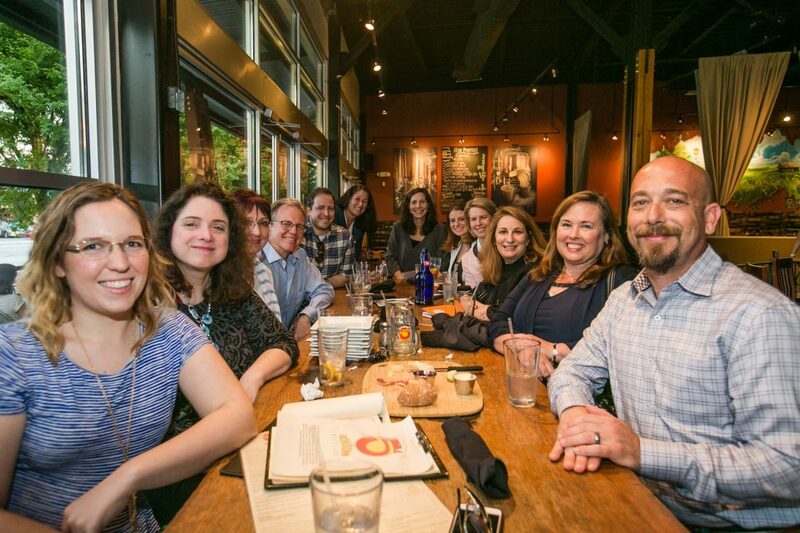 All of these projects had previously earned the IABC Atlanta Award of Excellence as part of the local chapter’s Golden Flame Awards competition. See the full list of international winners here. 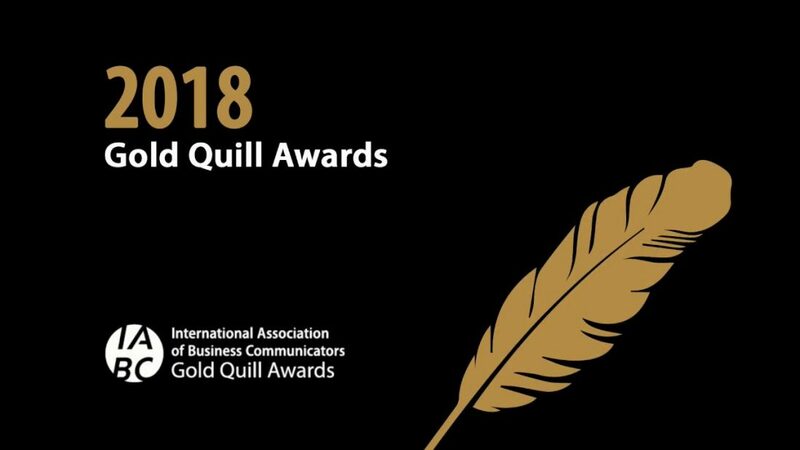 About IABC Gold Quill Awards: For more than 40 years, IABC’s Gold Quill Awards program has recognized and awarded excellence in strategic communication worldwide. The Gold Quill competition is the only awards program that honors the dedication, innovation and passion of communicators on a global scale. Since 2008, more than 4,451 projects have been entered in the Gold Quill Awards program. About IABC Atlanta: IABC Atlanta is the premier professional communications association that provides professional development, networking and best practices for a broad range of communication professionals at all career levels. With membership across internal and external communications, as well as executive, marketing and PR sectors, the association provides unique networking events and learning opportunities for communication professionals to advance their careers and build meaningful connections within the Atlanta community. More information about the organization is available at http://atlanta.iabc.com/. In Case You Missed It… An Overview of our April Networking Luncheon! We always hear that mentors are integral to moving in a positive direction along a career path. There’s less chatter about HOW to meet a mentor. 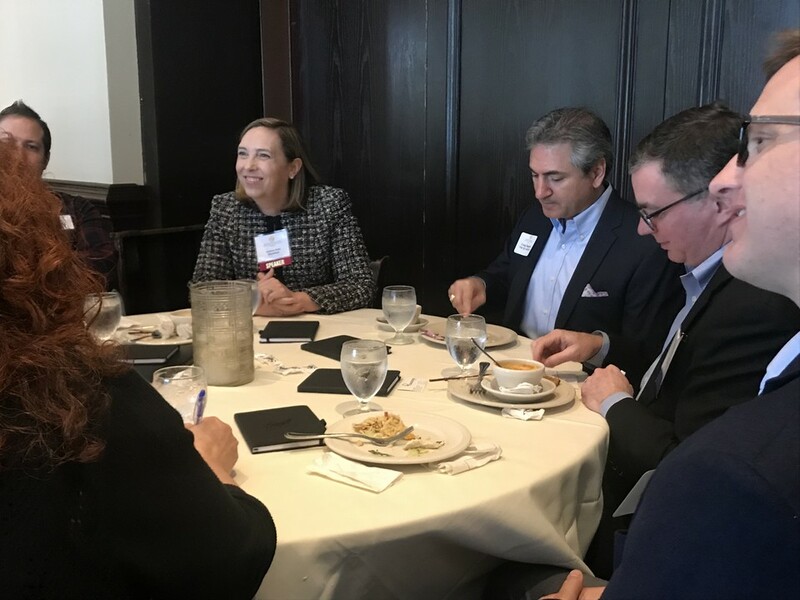 At April’s luncheon, IABC Atlanta’s members engaged in small group discussions with five of Atlanta’s leaders in business communications. Each walked us down their path to the corner office and shared advice about how we can do it too. My table’s discussion began with Terry Cerisoles, SVP, Corporate Communications at American Cancer Society. Terry referenced IABC’s Global Standard of the Communication Profession to share her best advice for building a communications career. She emphasized the power of choice in a career – from choosing between being well-rounded or an expert in a specific area, to the type of environment in which you want to spend your time and the companies with which you work. Our next visitor was Todd Wandtke, VP of Customer Communications and Digital Marketing at UPS. Todd’s role at UPS covers a wide swath: marketing, communications, events, and more. He regularly thinks about what’s next for UPS: digital marketing, storytelling, newer technologies and platforms. Todd related this to committing time to think about what’s next in our career. “How do the changes in the market influence your craft? Find and grow your place within industry changes,” he said. Todd shared four themes that he’s currently seeing in marketing. First, understand the power of storytelling. This is such a theme in marketing communications right now – because storytelling is interesting, and it works! Second, Todd touted the ability to understand and leverage analytics. UPS is investing in analytics as an integral part of determining where to invest and how well investments work: “We must answer the question of what a dollar of investment is worth.” Next, learn – keep on training, learning new things, growing your mind, every day! Finally, Todd told us to continue honing our basic skills: speaking well, writing to connect with others, and growing our emotional and interpersonal maturity. We next spoke with Joanna Irwin, Global CMO at Randstad, a staffing and recruiting firm headquartered in Netherlands. Johanna recently joined Randstad as one of its first U.S.-based senior leaders. After she left her previous role, she chose (is there an echo in here?) to be very intentional with her next career step. A career coach, networking, and taking time to reflect enabled that decision. The information she gathered drove her job search and led her to Randstad. As a recent executive-level job seeker, Johanna’s believes that the ability to connect personally with other company leaders is key to success. “At the executive level, everyone assumes that you have the skills. 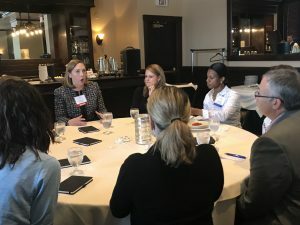 Making personal connections – building trust and understanding, and throwing in a little humor – are most important,” she said. Shirley echoed early mentors’ thoughts about the value of “basic” skills such as communications. She sees employee communication as one of companies’ biggest challenges right now. People who can devise ways to help employees assimilate information effectively will become more and more valuable. 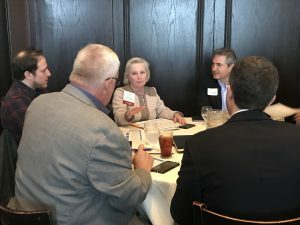 The small group format of April’s luncheon allowed members to engage in real, unhurried conversation with potential mentors. We’d love to hear about connections you made at the event – comment below, or message me to share your story! Shout out and thanks to our luncheon sponsors: Leland on Location, Poppulo, and Swift Branded Apparel and Products. Photos by the multitalented JoEllen Saeli-Lane. It’s Membership Month at IABC! It’s a big world out there for professional communicators – but you don’t have to go it alone. Why be a lone wolf when you can be a part of the tribe? The International Association of Business Communicators (IABC) is unequaled as a resource for community, networking, and professional development. Current members know it, and new members don’t take long to realize the benefits of IABC membership, or to wonder how they ever got along without it. Being a part of the IABC tribe brings you access to the Association’s full range of benefits and opportunities, including conferences, seminars, job postings, and our library of materials for perfecting and furthering the work you do. Above all, membership puts you in contact with a constellation of amazing professional communicators like you, all around the world, in every sector of business, ready to learn from you and help you to grow. Sometimes it takes a village… and sometimes it takes a tribe! March is Member Month, and while there’s still time, there’s no better time to join the IABC. What’s in the Grand Prize VIP World Conference Package? One full conference registration to the 2018 IABC World Conference in Montreal, including three nights of luxury hotel accommodation, shuttle service, conference VIP seating, and more! There’s no time like the present – start or renew membership with your IABC chapter today, and make 2018 the year you join the tribe! What’s your name, job, Twitter handle, etc.? How long have you been an IABC Atlanta member? TrueLanguage was invited to join IABC in 2012. I’ve gotten much more closely involved with the association in the last couple of years. Why did you join and what has kept you with the association? I joined because IABC’s vision and the vision of my company are in total alignment. IABC enables a global network of communicators working in diverse industries and disciplines to identify, share, and apply the world’s best communication practices. We facilitate communication across borders. As an active member, I value listening and learning from other communicators, and sharing our cultural and linguistic knowledge. We like to think we help emphasize the “I” in “IABC”! What do you love most about communications? Communication is never the same. The message is always different and every audience has different needs. How can we ensure that the message is understood? Should we use an eLearning environment, an infographic, a video component? What should it be for different cultures? Is it enough to offer the content in the local language or do we need to support the trainer with an interpreter? Every project is a dialogue – we communicate with the creator of the message, the linguist and the audience. Each new project that helps a client grow also lets us deepen our knowledge of various industries, and of how different cultures handle tricky language situations. What do you see on the horizon for your line of work? Technological solutions for collaboration and machine-assisted translation are enabling us to handle more content with faster turn-around times. However, the challenge of understanding the message and ensuring that it is localized without loss of meaning will remain the same. We’ll be able to think less about the logistics of translation, and give complete attention to perfecting the message in every language. What is the strangest communication request you have ever received? Atlanta’s growing status as a media/entertainment center has given us some cool projects with the video game and television fields. Our translators were really excited to work on material for tours of shooting locations for The Walking Dead! But the strangest? Once we were asked to verify that a certain word meant absolutely nothing… in every language. There are over 6000 living languages, so we had to scale it down quite a bit. Tell us something your IABC colleagues might be surprised to learn about you? They might be surprised to know that I was a dog obedience and agility trainer for 10 years and was very active in dog rescue. I don’t train dogs anymore, but I’m still supporting Georgia Jack Russell Rescue. Right now, I’m re-reading Cutting for Stone by Abraham Verghese. I’ve got a cool personal connection with this book: it’s based on real people, and the doctor in the story is based on the brother of someone I know. Sope Creek Park in Marietta is one of my favorite places to go, for hiking and biking. I also love going to Actors Express whenever I can. My daughter is a professional actress, it’s a fun way to support the arts! About the Author: Suzanne O’Brien works with organizations seeking stronger customer relationships to increase satisfaction, loyalty, and retention. Visit evergreenc.com. Social. Engagement. Collaboration. Transparency. Intranet. Chances are, you associate these terms with a sense of MORE content created by MORE people. But is that best for a business? 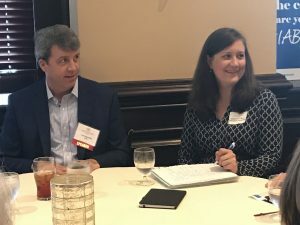 During May’s IABC/Atlanta luncheon, we learned how one company has seen intranet success by shutting down mass content creation and instead curating a communications ecosystem. Michele Shauf, Ph.D. is director of corporate learning at eVestment. With years of experience in organizational development and designing learning programs, she spearheaded a new approach to content and engagement for eVestment’s recent intranet revamp. Without social, communication can come from the center out rather than top down. Conversations don’t need to go on and on. They can end. And that’s good! More content isn’t better. More content is just noise; it undermines efforts. Just because someone can type, doesn’t mean they can create effective content. Equip employees to be strong collaborators. Increase productivity by reducing information foraging and [re]production. Shrink geographic differences and reduce travel costs – and globalize thinking. Establish two-way communication with associates, but only where appropriate. Embed micro-particle learning everywhere so that employees constantly absorb small pieces of information. eVestment designed their intranet to be a communication platform of curated content: a beautiful, carefully tended and walled garden, not a jungle. So how did they do it? First, they built the intranet inside every employee’s existing workspace. At eVestment, employees spend the most time working in their customer relationship management (CRM) software – so that’s where the intranet was built. Then they developed a content strategy that promotes cross-functional, global thinking. Each publication has an angle that reflects business priorities and business progress, buffering strategic foundations and providing a sense of accomplishment. Also, content is oriented to how it could be discussed with clients and in public. eVestment minimized distraction in the intranet by limiting employee profile fields to those that are relevant to work, and providing templates and a “controlled vocabulary” of suggested terms. They also configured out most social interaction options, leaving only content ratings and subscriptions. Finally, they took communications beyond the intranet and developed a full internal communications ecosystem. Channels include monthly town halls, a learning management system (LMS) for information that changes infrequently, and internal marketing – signage, a TV channel in the company gym, and a daily internal email summarizing the most important messages. eVestment teams still use other communication tools like Confluence and JIRA, Salesforce Chatter, SharePoint, Skype, and email. But that’s for team-based work only. For the intranet, employees are served a carefully designed and managed set of relevant, timely and succinct information. Luncheon attendees were gifted a copy of How to Measure Your Communication Programs, a manual by Angela D. Sinickas, ABC of Sinickas Communications. Thank you for this valuable resource! First takeaway: as business communicators, exercising a strong email game is essential to effective marketing strategy and execution. Then presenter Sharon Swendner of CRM Concepts opened the playbook, sharing ten Dos and Don’ts of Email Marketing: concepts and tools to ensure that email is an integral and effective part of marketing communications strategies. If the email doesn’t arrive, neither does your message. Learn your email service provider (ESP)’s definitions of deliverability vocabulary so that you can accurately evaluate the success of your email campaigns. Work with your ESP to implement strategies to increase deliverability, targeting 95% or higher. “People want to consume content if it’s good quality content,” said Swendner. Create a customer journey map of when your customers or target customers receive and interact with email. Send your communications at those times. Use customer data to target communications when it’s time to renew or re-purchase. Or ask the customer to tell you how often they want to hear from you, and segment your communications based on that preference. Ask customers and website visitors “early and often” to opt in to your emails. Display the sign-up call to action prominently in your website. Make it easy – minimize the information you request, but be sure to ask for the first name so that you can personalize your emails. The federal CAN-SPAM Act requires that commercial emails include an easy way to unsubscribe. Best practice is a link in each email that unsubscribes with one click. Increase open rates by personalizing emails with recipient-specific content from the user database in your ESP. One study found that just putting the recipient’s name in the subject line increased campaign open rates increased by 29%. Get creative! Insert the date of their last purchase, product- or service-specific renewal reminders, or suggest a next purchase based on what the recipient has purchased before. An email’s “from” section has two parts: the name and the email address. The CAN-SPAM Act requires that the domain name (company.com) and name are accurate to your organization and the group or person within your organization from which it’s being sent. For example, a sales email cannot come from support@company.com. Make the from name and email address short, personal, and specific. Try out different scenarios of an email to determine which best support achievement of your goals. First determine which elements you want to test: for example, content, personalization, formatting, buttons, words, titles, colors, positioning. Establish baseline metrics based on past campaigns (or an initial test send), along with a testing calendar. Then send different versions to different groups of recipients. Learn which scenarios best support your goals. Plan and document your email campaign data strategy. Carefully review the data fields in your ESP and audit them regularly. Gather results data on a set schedule. As mentioned earlier, email must be integrated into your overall marketing campaign. How does email fit into the customer journey? How should we use email to send recipients to other places? Use integrated marketing tools to view email results across your marketing ecosystem. Success is only a feeling unless it’s measured. Document baseline metrics as you’re identifying your current state. Build key performance indicators (KPIs) based on the campaign’s purpose and goals. Then measure relentlessly. Use the metrics you gather to analyze and predict activity and modify the campaign as it’s in progress to drive greater success. The last point is simple but integral: email must be part of your marketing ecosystem, and it must be balanced with your social platforms. Incorporate the above points into your strategy as well, and reap the benefits of email marketing. After sharing these points with plenty of detail and examples, Sharon brought it home by providing real-time feedback on several participants’ actual emails. CRM Concepts offers marketing strategy, digital marketing, CRM management, and more. Learn more at crm-concepts.com. Thank you to IABC/Atlanta member Swift Incentives for sponsoring the luncheon. I joined when I was Publications Manager at Scottish Rite (now Children’s Healthcare of Atlanta at Scottish Rite) because IABC offers excellent professional development for internal communications. Through IABC I’ve made contacts for great freelance projects; learned, by preparing and judging award entries, a tremendous amount about measuring results and documenting them, which is invaluable in the grant writing I do now for nonprofits; and made terrific friends. I am proud of IABC for recently circulating a petition stressing, in this age of “alternative facts,” the importance of truthful and ethical communications. In grant writing, the best thing, of course, is when you get the grant, especially when it’s from a new funder. For my more creative work, like profiles, I love it when I’m told I really captured the essence of a person, or demonstrated why a program is so critical. Most, although not all, of my clients are nonprofit, and I see more mergers on the horizon. Literacy Action, where I worked part-time for six years (a job I got through an IABC connection!) merged with Literacy Volunteers after I left, and Genesis, whose Board I served on for seven years, merged with Our House. This was actually something I offered, but I helped a friend prepare an ad for Atlanta Singles magazine when she and I were both single. 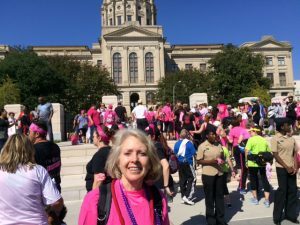 Most people who know me realize I’m not athletic and would be surprised to know I raised about $3,500 by participating in the 2016 Atlanta 2-Day Walk for Breast Cancer (10-miles on Sunday morning portion). Because I’m a soon-to-be three-year breast cancer survivor, this was a particularly happy and gratifying experience. Franklin and Winston:- a “warts and all” portrait of these two men and their friendship, arguably the most important among 20th century world leaders. I love revisiting their words, which brought courage and hope to their citizens in the darkest days of World War II. I’d have to say our home, which has woods, a creek and 2 dogs that my husband and I have enjoyed for many years. 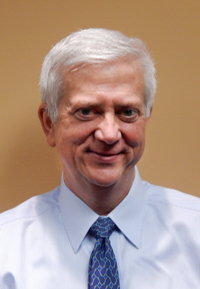 I’m Bill Nicholson and I have the privilege of leading the Atlanta office of PRM, a consultancy with broad and deep experience in human resources and internal communication. I avoid social media like the plague but am considering updating my LinkedIn profile during 2017. Since 1993, and before that I was involved in IABC chapters in Dallas and Denver. I joined to network but great programming provides the ‘stickiness’ that keeps me renewing. We never experience the same day twice. Change. The topics we communicate – especially healthcare benefits – are constantly changing and of course the channels we use are very dynamic as well. When I worked in the Dallas bureau of CBS News, people would call asking for directions to J.R. Ewing’s ranch (a setting in the fictional but very dramatic Dallas television series on CBS). This might be a record: I’ve won Gold Quills more than 30 years apart. In 2016, we had a great team on a medical plan enrollment that earned a Gold Quill, and my first one was in something like 1982. I think that was shortly after Guttenberg invented movable type. Communication has come a long way and it’s remarkable how IABC has been there to support and advance our profession at every turn. When Breath Becomes Air by Paul Kalanithi. It’s about coming to terms with what really matters. Dear Mrs. LaRue: Letters from Obedience School by Mark Teague. It’s a children’s book. Or is it? Hartsfield-Jackson before a morning flight – just like Grand Central Station at rush hour is my favorite spot in New York City – because the vitality is palpable.